If you were 4 years old when 9/11 occurred in 2001, then you’re now old enough to enlist and fight in the war on terror. Recent geo-political events suggest that this conflict may endure for some generations to come, so, regretfully, your children may also get to participate. The war on terrorism is apparently part of our culture and part of our lives now. By no means a prophet, Hunter S. Thompson was just an eccentric observer with a knack for connecting the dots between political events and the ongoing mainstream media narrative that supports and manufactures consent for the oligarchy. When taken at face value, the terror script is indeed a rather convincing and motivating story, but when you dismantle the official fiction and bring the hidden pieces into the picture, the truth about the war on terror is just too heavy for conscious people to ignore any longer. As it persists, international terrorism is guaranteed to increase, and as time goes by, we learn more and more about the real reasons why we’ve been forced into this apocalyptic conflict. After nearly 15 years of kicking down doors, drone bombing villagers, shattering societies, and mourning our own senselessly dead, here are 6 things we now know for sure about the war on terrorism. 1.) The war on terror was never about ensuring the security of Americans at home or abroad, nor was the current situation the result of foreign policy blunders. The conflict was engineered from the onset to break up, destroy and destabilize most of the oil-producing countries in the Middle East and Northern Africa. The war on terrorism is about control of oil, about conquering national economies and turning them over to ‘foreign investors,’ about demonizing Muslim nations, about creating a lawless territory in which to develop Western controlled mercenary armies like ISIS, about protecting Israel’s interests in the region, aboutdestabilizing Europe, about opening access to the poppy fields of Afghanistan, and about punishing those nations which dared to defy the international banking cartel by moving to avert the petro-dollar. The war on terrorism is also about radically altering the legal framework of Western governments to allow for greater surveillance, control and the militarization of once free societies. The aim is to continually broaden the definition of terrorism so that any act of defiance against the state or the corporate oligarchy, whether advocating for human rights, the environment, or any other issue of popular concern, can be persecuted without due process. The war on terror will be used to target American citizens who support the idea of limited government and strive to maintain the protections afforded by the Constitution and the Bill of Rights of the United States of America. Additionally, the war on terror is about creating new markets for the security industry and opening steady income streams for war profiteers and arms manufacturers, so that a relative minority can profit heavily from the continuance of the war and the waste, swindling and destruction involved. 2.) The war on terror doesn’t stop terror, because it is terror. 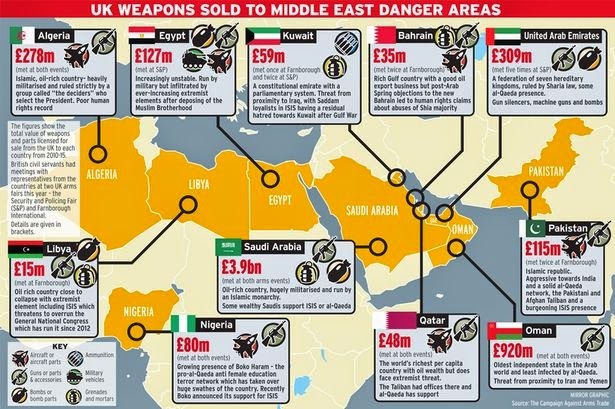 The Western nations most heavily invested in the war on terror are also the nations most heavily involved in global arms trading, which gives advanced weaponry to any despotic tin pot dictator with an oilfield. And France just happens to be the world’s number one exporter of arms per capita.The Western ‘coalition’ regularly kills civilians in other nations directly and indirectly, which is in and of itself a very real type of terrorism. Regional arms sales by the UK. 3.) Our worst terrorist enemies are the products of government, the military industrial complex and Western intelligence agencies. The Mujahideen was originally organized, funded, trained and supplied by the CIA to oppose the Soviet Union. The Mujahideen became Al Qaeda with the assistance of Saudi Arabia and American training, arms and financial aid. Al Qaeda has morphed into, or been replaced with ISIS, who is the creation of the military industrial complex, the US, Israel, the UK and France, and is supported by some 40 other nations who knowingly trade and deal with ISIS. ISIS, the new Islamic Caliphate as they call it, is the most barbaric, cruel and inhumane social movement to come about in some number of centuries, perhaps even a millenia or more. ISIS was given birth and nurtured into being by the West, and now, primarily Muslim people are suffering horribly in their own homelands while the war intensifies and extends into Europe in acts of urban terrorism. Video from November 2015 of an ISIS fighter in Syria using an American TOW missile to waste an American Humvee. 4.) The mainstream media plays a crucial in perpetuating the war on terrorism. The primary role of the corporate-owned and government-controlled mainstream media is to transform selected acts of terror into enduring symbols that can be used again and again to reinforce the war on terror narrative. Their secondary role is to keep the level of tension and stress as high as possible by ceaselessly over-reacting to non-events and over-reporting on non-issues, thereby keeping the public captivated and hypnotized by an ongoing drama so that when a major event does occur it has the greatest possible psychological impact. Reporting on global terrorism is duplicitous and hypocritical because certain events have more franchise than others in influencing public support for government policy changes and military actions. In the practical world of marketing, French flags pictured draped over national monuments at night-time will go much further in promoting the war on terror than Kenyan flags draped over African monuments. The media uses shock and awe in a war of psychological attrition against the public. The objective is to incapacitate and sideline people from participating in dissent, while scaring people into acquiescence to any imposed government authority or security measures. 5.) State-sponsored False flag attacks still work to achieve political objectives. There is a tremendous continual international effort underway to expose the true facts behind each new terror attack, terror plot, and major government lie. The alternative media is growing in reach and effectiveness, however, the reality is that the Hegelian dialectic of problem, reaction, solution still works on a shell-shocked public. 6.) Suicide is more deadly to our soldiers than any terrorist organization. The war on terrorism represents the first time in US history that suicide has been the leading cause of death of US soldiers. The psychological impact of this type of conflict is unique and the suicide rate of returning soldiers may be our best evidence that the war is unwinnable. The goal of the war on terror is transform people into willing participants in chaos, mayhem and murder, or to turn them into collateral damage. Nobody is born a terrorist, and we are all being set up as dispensable pawns in an orchestrated clash of civilizations. The truth is out there. When you cut through the propaganda, emotional triggers, and the divisive nature of discourse today, what’s left is the truth that the war on terror is something that we must end. The rise in global consciousness and our willingness to speak out may be our only hope. This article (6 Painful Truths About the War on Terrorism) was originally created and published byWaking Times and is published here under a Creative Commons license with attribution to Dylan Charles and WakingTimes.com. It may be re-posted freely with proper attribution, author bio, and this copyright statement.